This is the 57th edition of the newsletter that keeps you up to date with the progress of the Germany Beck junction works on the A19 in Fulford. The past 2 weeks have been spent making sure we are ready for the top layer of surfacing to be laid across the new junction from Monday night. Traffic signals have been installed. The new traffic islands are complete. Tactile paving (paving slabs with dimbles) has been laid to all the pedestrian crossing points and damaged kerbs replaced. 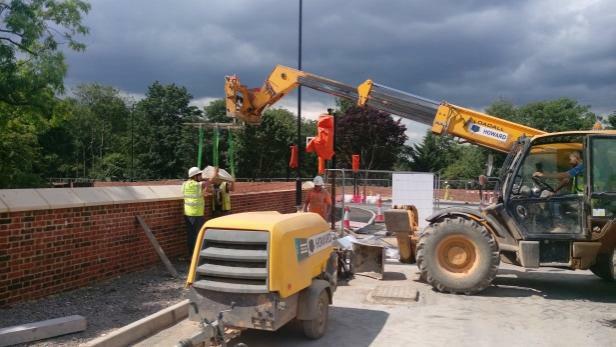 Copings have been lifted into place on the top of the walls around the site. The plastic black trays seen below is the maintenance parking area waiting to receive concrete which will be poured to fill the spaces between the black crosses. 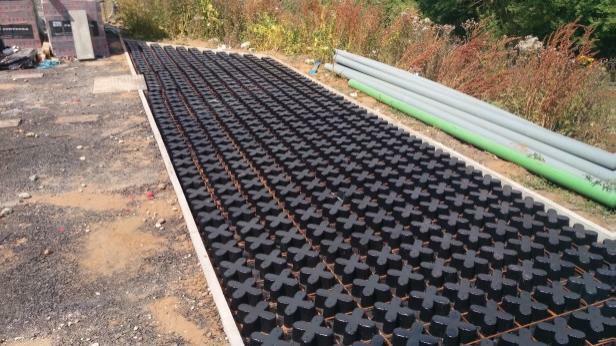 Once the concrete is set the black plastic crosses are melted away with a hot air gun and the crosses filled with topsoil and grass seed. During the next week we will be laying the top layer of surfacing across the whole junction. 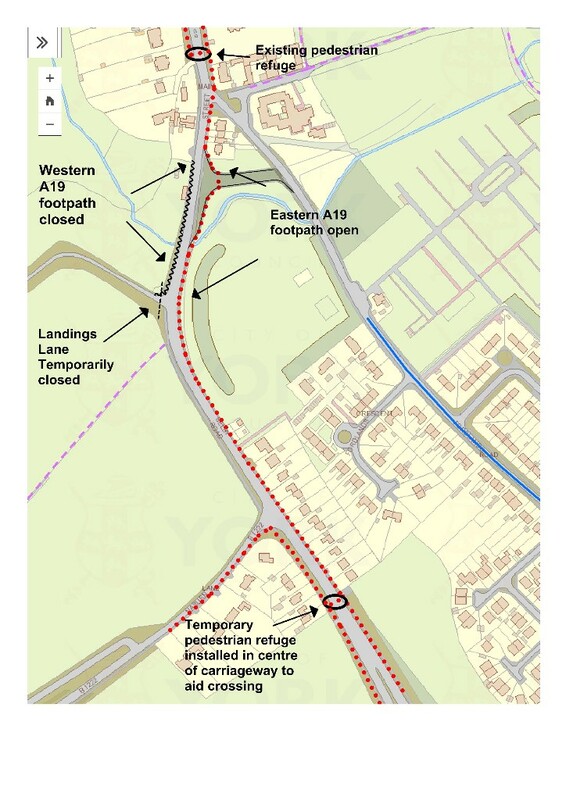 This will take place at night when the A19 will be completely closed from 9pm to 6am for 4 nights. The full closure is required due to the large width of the surfacing machine; traffic simply will not be able to get past at the narrowest sections of the road and the number of machines and delivery wagons required to carry out the works will take up the whole footprint of the junction and spine road. The work is likely to be noisy as we need to remove the top layer of the existing surfacing at the tie ins and also adjust the previously laid surfacing to level. Please accept our apologies for the disruption over the next week. Following the surfacing we will be installing the road markings, also at night. After this the traffic signal installers will be commissioning and testing the traffic signals as we continue to install the concrete beam across the Germany Beck culvert. 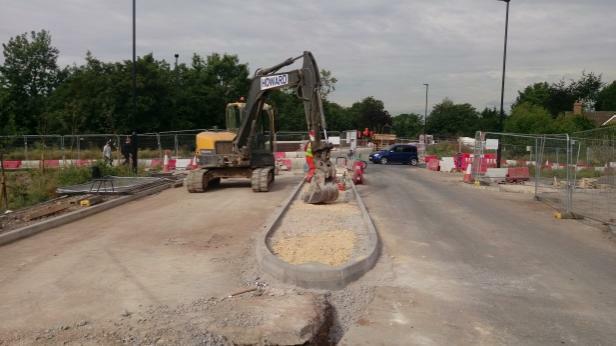 Elsewhere on site we are continuing with a deep foul sewer diversion and the first roads into the new residential development following the ongoing drainage installation. Commencing Monday 23rd July there will be a series of night time closures to the A19. 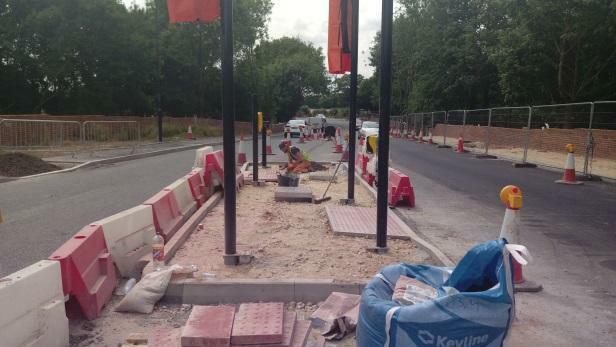 This will completely close both northbound and southbound carriageways at the new junction location in Fulford. The full A19 closures are required in order to carry out the final surfacing layer and install road markings to the A19 junction and are made in full agreement with CYC. The works are expected to take 4 nights. The closures will be in operation from 9pm until 6am the following morning. Fordlands Road will remain open, but with access to Fordlands Road from the north only. Access through the work for pedestrians will be maintained at all times throughout the road closure period along the existing eastern footpath..
Cyclists should dismount and walk their bicycle along the eastern footpath. Signposts will be erected along the route to guide you.